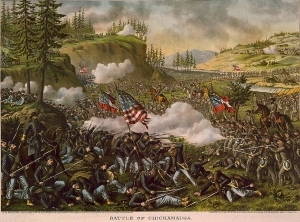 Fought from September 19 to September 20, 1863, the Battle of Chickamauga produced the highest casualty totals for any battle in the western theater of the American Civil War and second only to the Battle of Gettysburg for the entire war. Following the Battle of Perryville (October 8, 1862), Confederate General Braxton Bragg ended his Heartland Offensive and withdrew his forces from Kentucky to Tennessee. There, Bragg's command was reorganized, consolidating with General Kirby Smith's Army of Kentucky, to form the Army of Tennessee. In November, Bragg established a defensive position along the West Fork of the Stones River, near Murfreesboro, intent on preventing a Union advance on Chattanooga. Frustrated because the Union forces did not immediately pursue Bragg during his retreat from Kentucky, President Abraham Lincoln relieved Major General Don Carlos Buell of his command and placed Major General William Rosecrans in charge of the newly formed Army of the Cumberland on October 24, 1862. Upon Rosecrans's promotion, Union General-In-Chief Henry Halleck made it clear that "… the Government demands action, and if you cannot respond to that demand some one else will be tried." Rosecrans quickly established headquarters in Nashville, Tennessee and prepared his army for battle. On December 26, Rosecrans left Nashville with approximately 44,000 men prepared to engage Bragg's army of 38,000 soldiers encamped at Murfreesboro. Between December 31 and January 2, the two armies clashed at the Battle of Stones River, near Murfreesboro, Tennessee. The Union army suffered higher casualties than the Rebels, but Bragg was forced to retreat when Federal reinforcements began arriving on the site. On January 3, the Army of Tennessee withdrew to Tullahoma, Tennessee, thirty-six miles to the south, yielding Murfreesboro to Rosecrans. The two armies did not confront each other again until June, when Rosecrans moved on Tullahoma. There, Rosecrans cleverly outmaneuvered Bragg, forcing the Confederate army to retreat to the relative safety afforded by the mountainous terrain and Tennessee River at Chattanooga. Rosecrans followed, and by mid-August, the Army of the Cumberland was on the outskirts of Chattanooga. Once again, Rosecrans outmaneuvered Bragg. By sending a column of Federals upriver, a few miles north of Chattanooga, Rosecrans convinced Bragg that he intended to cross the river and attack from that direction. Meanwhile, the bulk of the Union army was crossing the Tennessee River below the city. By September 1, the Army of the Cumberland had crossed the Tennessee River without any resistance. Realizing that his army was once again in peril, Bragg abandoned Chattanooga on September 9, 1863, marching his army into northern Georgia. Rosecrans had achieved his goal of capturing Chattanooga, but rather than regrouping and securing the city as he had done at Murfreesboro, he decided to pursue Bragg's army into Georgia. Initially, Rosecrans deployed his army as three isolated corps. During the second week of September, Bragg mishandled several opportunities to inflict damage on the isolated units. Rosecrans eventually recognized that his army was endangered and moved to reunite it. Intent on recapturing Chattanooga, Bragg decided to attack the one corps of Rosecrans's army that had yet to be reunited. On September 18, the Confederates assaulted several crossing points on Chickamauga Creek that were held by Federal troops, with the intention of assaulting the isolated left wing of Rosecrans's army. Union resistance was fierce, and although the Rebels eventually crossed the creek, they did not do so in time to launch a full-scale attack that day. The main battle began on September 19, when Bragg ordered a major assault on the Union left. Despite repeated attacks from the Confederates, the Federals held their lines throughout the day. That night, they pulled back and constructed log breastworks along a new line. On September 20, Bragg renewed the attack. During the late morning, Rosecrans was mistakenly informed that the Rebels had created a gap on his left flank. He responded by sending reinforcements from his center, inadvertently creating a real gap there. General James Longstreet immediately exploited the new gap and drove one-third of the Union army, including Rosecrans, from the field. General George H. Thomas took command of the remaining army and withstood Rebel assaults until nightfall. The remaining Union forces then retreated to the safety of the mountains. On September 21, the Army of the Cumberland withdrew to Chattanooga and took up positions in the defensive works previously constructed by Bragg's army. Bragg responded by seizing the high ground overlooking Chattanooga (Lookout Mountain, Seminary Ridge, and Raccoon Mountain) and laid siege to the city. The Battle of Chickamauga was costly for both sides. The Union army suffered over 16,000 casualties (killed, wounded, and captured or missing). The Confederates suffered over 18,000 casualties. The combined losses were the highest total for any battle in the western theater of the American Civil War and second only to Gettysburg for the entire war. In the end, Bragg achieved a tactical victory by forcing Rosecrans to retreat, but he did not achieve his strategic goal of recapturing Chattanooga.